Can you keep a secret? I can’t! I’m a journalist, and journalists are all about making secrets public. Anyway, it kills me that I have to keep a major secret from almost everyone I know. Even my best friend, Hailey Jones. But I will tell you, if you promise not to tell anyone, okay? Here it is: I am Dear Know-It-All. Dear Know-It-All is the advice column in our school newspaper, the Cherry Valley Voice. Kids write in with questions about everything from homework to love lives to troubles at home. And each year one of the kids on the newspaper staff is chosen to anonymously write the answers, and this year it’s me! Can you believe it? I myself was shocked when Mr. Trigg, our faculty advisor, called me at home to ask me to do it. But it’s pretty fun, and an honor, even if it’s a lot of responsibility. In my first column, I answered a letter from someone asking what they should do if they liked their best friend’s crush. Then I discovered by accident that it was Hailey writing in about liking my crush, Michael Lawrence! So after lots of angst, and a lot of thinking on my part, I wrote a column telling her to go for it—all’s fair in love and war and all that—and then I held my breath to see what would happen. Hailey ended up confessing to me that she’d written the letter to Dear Know-It-All, and I had to pretend I didn’t already know. The good thing was, in the end, she decided she didn’t really like Michael, anyway. Phew! ’Cause I still do! But that’s kind of another secret, okay? So, as you can see, it’s crazy stuff. If I wrote it up as a story for the Cherry Valley Voice, the headline would be Advice Columnist Caught in Love Triangle. I love writing headlines, by the way. It’s one of my greatest strengths as a journalist. Our new issue comes out today, and I can’t wait to see what people think of my latest column! Part of my job as Dear Know-It-All is to make my columns “jazzy.” This one is jazzy all right! I really went all out and gave some pretty rad advice, if I do say so myself. I think it will have everyone talking. Here’s what it was: A girl (who called herself Tired of Waiting) had written in to say she had had a crush on a guy for a long time and was tired of waiting for him to notice or to ask her out. She wasn’t sure he even knew she walked on the planet, let alone liked him. I had (anonymously, of course) replied that in this day and age, it wasn’t all up to the guy. She should be a modern girl and just take charge and ask him out herself. I was pretty proud of that answer. It was sassy and modern and brave, not to mention well-written, if I do say so myself. The funny thing is, I’ve been in the same situation for years and I would never dare to ask Michael out, but that’s because I’m such a chicken. I’ve learned that I can give pretty good advice. Following it is a whole other story! Anyway, we always have a newspaper staff meeting in the afternoon, either on the day of or the day after the new issue of the Cherry Valley Voice comes out. Mr. Trigg likes everyone to have a chance to read it and get a sense of what our readership thinks of it. Then we all get together with him and our editor in chief (the job I want next year, if Michael doesn’t get it! ), and share info and brainstorm about our next issue, which we have to start on right away. A couple of issues ago Michael and I coreported and cowrote a really big article on our school’s new curriculum, and the article was a huge success. Mr. Trigg decided Michael and I are a great team—love that!—and he asked us to come up with another “blockbuster example of investigative journalism” for the meeting today. Mr. Trigg has a pretty funny way of talking sometimes. But it’s pretty cool he chose us for another feature story. The only thing was, we were stumped for a topic. Michael and I had made a plan to meet for lunch in the cafeteria to brainstorm. We started hanging out more after we wrote our last article together, but it’s still pretty major for me to be going to lunch with Michael Lawrence, love of my life. The weird thing is, though, it’s kind of like there are two Michael Lawrences. There’s Michael my crush, whom I’ve loved since I was six (even though he caught me eating paste in kindergarten—I swear, I thought it was frosting—and has called me Pasty ever since) and who is just the cutest, coolest guy on the planet who makes my stomach go swoosh. Then there’s Michael my writing partner, with whom I fight and negotiate with for assignments and about fact-checking, and stress over sources and all kinds of unromantic stuff. Then he’s just kind of a friend. It’s hard to believe that those two Michaels are the same guy. Anyway, lunch. We got on the cafeteria line and were brainstorming the whole way, stopping occasionally to eavesdrop on people who were talking about the new issue of the Voice. “What about something on allergy medication and how suddenly everyone has allergies? We could interview the school nurse and my pediatrician.” Michael’s dark eyebrows were bunched in thought, and his bright blue eyes narrowed as he considered the story’s angles. “Hm. That could be good,” I said, distracted as I searched hopelessly for something to put on my tray. Now, I am a big eater. I’m tall, but I’m pretty thin. I am not picky, and I love food and need to eat often to keep my stomach full, otherwise it grumbles noisily and embarrasses me. But lately I’ve just been stumped by or grossed out with the cafeteria. Like today, here were the choices: a limp iceberg lettuce salad, orange JELL-O, crunchy Rice Krispies Treats, dry-looking mac and cheese, and tofu dogs—yuck! Kitchen Staff Poisons School Kids with Barfy Lunch! I looked to see what Michael was getting and saw that he was taking one of everything. “Why? You want me to share this food with you too, Snacky?” His eyes twinkled as he teased me. Michael comes up with new nicknames for me all the time. It used to really bother me, but Hailey said that he does it because he likes me. If that’s true then I don’t mind being called things like Snacky. Well, not too much. Michael has had to share his snacks with me on a few occasions when I got hungry and my stomach growled. I still get embarrassed by it. “Well, the thing to do is take one of everything, then take two bites until it grosses you out, and move on to the next thing. You can get pretty full doing that.” He grinned. “Okaaay,” I said. I wasn’t convinced I should take gross food at all, but if it worked for Michael . . .
After loading up my tray with one of everything, I looked around for a good place to sit while Michael got milk. It would have to be close by, because the tray was very heavy. Across the room I spied Hailey waving at me to join her. By the way, I still feel a little nervous when Hailey and Michael are together—like I have to watch my back. I do believe Hailey when she swears she’s over him, but then that also annoys me, because who could ever get over Michael Lawrence? But Hailey is my best friend, so I have to trust her. Anyway, I called over to Michael, “Let’s sit with Hailey,” and he nodded. 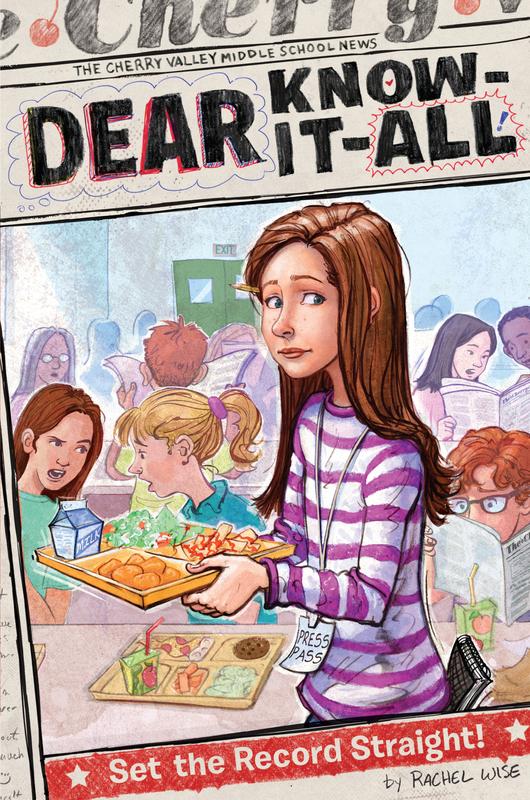 I crossed the room, my full tray held high over people’s heads, and about halfway there I overheard some kids talking about the new Dear Know-It-All column. Of course I slowed down. “I would never ask a boy out!” said one of the girls, Tracey, from my math class. She and her friends had a copy of the Voice laid out on their table in front of them and they were all looking at it. “I would!” said a girl I didn’t know. I slowed down to a crawl, acting like I was looking for a spot to sit. “Only if you had gone out with him already first, when he’d asked,” said Kim, a pretty girl from my language arts class. Hmm. She had a pretty good point. Anyway, at least my answer had gotten people talking. I walked toward Hailey. At another table there were a bunch of boys talking about the column. I paused again. I love hearing people talk about the column, because no one knows it’s me who wrote it. Plus, I’m curious to know what people think. He is such a nerd. I wanted to say, Don’t worry, buddy. It’s not gonna happen, anyway, but I restrained myself. One of his friends was looking kind of thoughtful. “I would say yes. I mean, why does it always have to be us doing the asking?” he asked. Bingo, brother! My point exactly. I smiled at him in gratitude, but then caught myself. I was supposed to be anonymous! Uh-oh. I took a deep breath and kept walking, reminding myself that part of being a journalist is provoking conversation. And anyway, why is that “the way it’s done”? Says who, I’d like to know. “… really bad advice!” I heard someone say as I passed another table. My stomach clenched. Were they talking about the Dear Know-It-All column too? Ugh. Maybe I’d been too daring. But everyone sure was talking about it! I reached Hailey and dropped my tray onto the table with relief, and mostly because it was so heavy from taking one of everything. As I did so, everything jostled and mixed all together in a revolting fashion: apple juice spilled over iceberg, JELL-O in the mac and cheese—just gross. “Argh!” I cried. This was turning into a very bad lunch in all ways. “Why ‘finally’?” I asked, pulling out my chair and sitting down heavily. “Okay, ladies, bon appétit!” said Michael, placing his tray next to mine on the table and sitting down. She shook her head in annoyance. “Can’t say now,” she whispered, flicking her eyes toward Michael. Double ugh! I’d never been annoyed to see Michael before, but now I was. I glanced down at my tray. It looked disgusting. I didn’t know where to begin. “I meant two bites of each thing at a time, not mixed all together, Pasty,” Michael said, shaking his head and laughing. “Ha-ha,” I said. I took a deep breath and pulled my long, brown hair into a ponytail while deciding what to tackle first. Suddenly I felt a nudge. I looked down, and Michael had a granola bar in his hand and he was poking me with it. I wanted to say no, just on principle, but I knew I’d be starving before too long, so I reached out and took it. “Thanks,” I muttered, feeling grumpy. “I carry them for you,” said Michael, grinning. “Yeah, right,” I said, annoyed that he was teasing me about my appetite again. “For real,” Michael insisted, serious now. Oh. Was this a good thing or a bad thing? I’d need to dissect it with Hailey later and decide. Either Michael worried that I was a liability when hungry and needed to be appeased, or he was being considerate. Or maybe both. Either way it was probably good that he was thinking about me. Right? Or maybe what he was thinking was that I was a starving pig! Oh brother. Either way, I was hungry. Starving Journalist Goes on Eating Spree! Nothing Is Safe! I unwrapped the granola bar and glanced at Hailey’s tray. “What did you have?” I asked her, biting into the bar. I chewed thoughtfully. “This is not a third-world country, you know. We have more than just rice to eat.” That’s something Hailey’s mom always said to her. I turned to her midbite, with half the granola bar hanging out of my mouth, and then looked at Michael with wide eyes. “Bingo!” I said through the rolled oats. Kids Tired of Terrible Food, Beg for Mercy. Hails? That’s my nickname for her. Grrr. Now all of me was growling, not just my stomach. Hailey smiled and fluffed her short blonde hair with her fingers. I squinted at her to see if she was flirting, but she looked innocent. How could she really not like Michael? He was so perfect. . . .
“I said it a couple of weeks ago. I would have thought you’d remembered,” she said to him. Phew. I was glad Michael hadn’t. That meant he didn’t pay too much attention to what she said. And he was too busy remembering granola bars for me. “It’s a good idea,” I said. “We’ll present it at the meeting today and see what Trigger thinks.” I reached into my messenger bag for my trusty notebook. I made a note on my to-do list, snapped the book shut, and placed it in the bag. Nothing gets remembered unless I write it down, even though Michael teases me for it. He thinks I’m just a bad listener, but I don’t care. This is just how my brain works. I finished my granola bar and then put the empty wrapper onto my tray. True to his word, Michael had sampled everything on his tray exactly twice. Jeff Perry is in our grade, and he’s one of Michael’s best friends. He’s the photographer for the Cherry Valley Voice and always has a big camera slung over his narrow shoulder or around his skinny neck. He’s pretty funny, but sometimes you wish he didn’t take quite so many photos. They don’t always turn out so great, and he isn’t shy about posting them on Buddybook. My dream is that one day Hailey will decide she loves him. I think they’d be great together. And then I really wouldn’t have to worry about Michael. “See you at the meeting,” I said to Michael. When Michael had left, Hailey turned to me. “I thought he’d never leave,” she said.